As we close the Fertility Awareness Methods (FAM) Project, which has been supported by USAID since 2007, we celebrate success in five countries – Democratic Republic of Congo, Guatemala, India (Jharkhand), Mali, and Rwanda – that have expanded their capacity to meet the family planning needs of the people they serve by offering fertility awareness-based methods (primarily Standard Days Method). We are thankful for our legacy of collaboration, commitment, and quality, providing the development community with frameworks and tools to scale up proven innovations. We continue on with initiatives in Benin (Tékponon Jikuagou) and Uganda (GREAT Project), also supported by USAID and foundations that are committed to improving reproductive health. Together with our partners, we’re developing and testing scalable strategies for decreasing the barriers to family planning use, and encouraging healthy, gender-equitable attitudes and behaviors among youth. As we move into 2014, we begin a new era with the FACT Project (Fertility Awareness for Community Transformation) to increase fertility awareness and expand access to fertility awareness-based methods of family planning outside the health system. Finally, we are using a multi-pronged approach to leverage under-utilized channels and emerging pathways to expand access to family planning information and services through the new A3 Project (Access, Availability and Awareness). So as we end one chapter, continue with others, and begin new ones, we are thankful for our many friends and supporters, our colleagues in the countries in which we work, and those who benefit from our efforts. As always, we invite you to continue to engage with us throughout the next year. 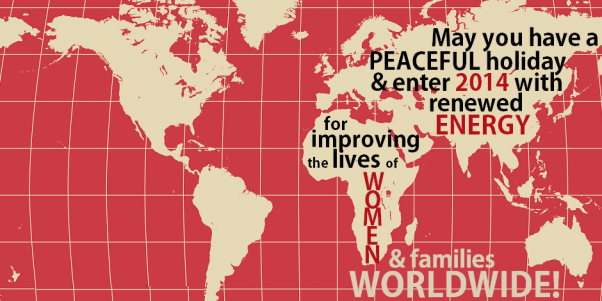 May you have a peaceful holiday and enter the new year with renewed energy and enthusiasm for improving the lives of women and their families worldwide!